Register at backtoschool.clubtyson.com for a chance to win back-to-school prizes and even a Nintendo Switch. 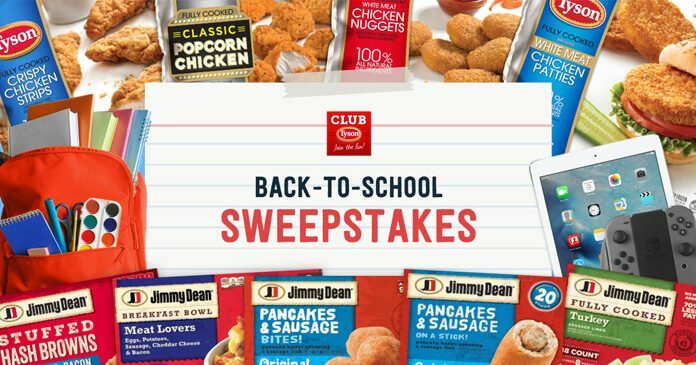 Tyson Foods is giving you the chance to win backpacks filled with everything you’ll need to go back-to-school in style. Enter the Back To School Sweepstakes and you could also win the grand prize consisting of a Nintendo Switch, iPad, HP Notebook, Beats headphones, and more. which they reside at the time of entry. Begins on or about 2:00 pm CT on July 26, 2017 and ends at 6:00 pm CT on September 18, 2017. Participants will only receive a maximum of four (4) entries total, regardless of method of entry. A random prize drawing will be held on October 5, 2017 at 2:00 pm (CT) from all eligible entries and/or Submissions received. Backpacks will be filled with school supplies. The Sweepstakes is sponsored by Tyson Foods, Inc., 2200 Don Tyson Parkway, Springdale, AR 72762-6999 and is being administrated by Dom & Tom Inc., 625 N Michigan Ave, 18th Fl, Chicago, IL 60611.